On Being Different: Diversity and Multiculturalism in the North American Mainstream 4 Edition Understanding of cultural diversity is essential to a healthy multicultural society. Fundamental to this book’s approach is the belief that a comparative, cross-cultural view of human differences and similarities enhances understanding of diversity and multiculturalism within contemporary North America. 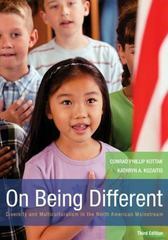 On Being Different provides an up-to-date, comprehensive, and interdisciplinary account of diversity and multiculturalism in the United States and Canada. Conrad Kottak and Kathryn Kozaitis clarify essential issues, themes, and topics in the study of diversity, including ethnicity, religion, gender, and sexual orientation. The book also presents an original theory of multiculturalism, showing how human agency and culture work to organize and change society.